Israel will construct a 100M NIS terminal to allow residents of Shuafat neighborhood easier access to the rest of Jerusalem. Israel plans to construct a security terminal to allow residents of the Shuafat neighborhood of northern Jerusalem easier access to other parts of the city, according to Bemaceneh military magazine magazine. The terminal, intended to facilitate vehicular access for the 25,000 residents of of Shuafat who hold blue identity cards [denoting Israeli citizenship or permanent resident status -ed. ], is to be built as a result of a decision by Israel's High Court of Justice. It is expected cost close to 100 Million NIS. 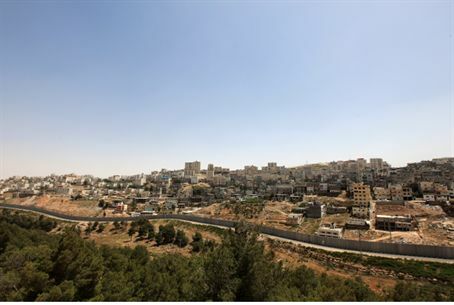 Shuafat, which lies within the municipal boundaries of Jerusalem, was placed on the east side of the separation fence Israel is constructing in Judea, Samaria, and parts of Jerusalem, even after residents petitioned the High Court. The Court's decision was based on the fact that 15,000 residents possessed orange identity cards [denoting non-citizen Arab residents of Judea and Samaria who may enter Israel's sovereign territory - ed.]. "We explained to the High Court, due to operational security considerations, we were obligated to leave Shuafat, which has thousands of Arabs with blue identity cards, outside the fence," a senior officer with the Central Command told Israel National Radio. "The court approved the route, but stipulated a terminal building must be built to provide the highest service for residents of East Jerusalem." At present there is a small, interim foot-corridor servicing Shuafat. According to the plan, after the new is constructed, and an inspection station completed, vehicular traffic will be enabled and representatives of government ministries will be able to give services to area residents. "Thanks to the new terminal, movement in and out of Jerusalem will be faster for Arab residents, along with a more pleasant environment," the Central Command officer commented. When finished the terminal will be the largest crossing in and out of Judea and Samaria. It is unclear, due to budgeting constraints, whether the new terminal will be staffed by a private firm or a cadre of border police. The High Court of Justice's ruling, as well as its placement vis-a-vis the separation fence, renders the practical status of Shuafat and neighborhoods like it ambiguous and could be construed as undermining the de jure sovreignty Israel has exercised in East Jerusalem since June 28, 1967. In 1980 Israel amended its Basic Laws to include the Jerusalem Law, declaring Jerusalem "complete and united," and to be "the capitol of Israel".